Home / Blog / General / How sustainable is our new cork collection? How sustainable is our new cork collection? We launched our new CORK COLLECTION in November 2018 and have spent the past weeks introducing designers and architects to the material’s many beneficial properties. Cork flooring planks are a practical and stylish solution for commercial interiors – but they’re responsible too, positively contributing to a sustainable environment and offering exceptional specs. So what is it that makes our cork flooring collection so sustainable? Cork is made from Portuguese cork oaks that are stripped of their bark every 9 years from the age of 25. The trees aren’t cut or damaged and the bark simply regenerates between harvests, meaning no loss of habitat for local species. There’s less need for heavy machinery, too. Cork trees retain a high amount of CO₂ – much more than they emit. 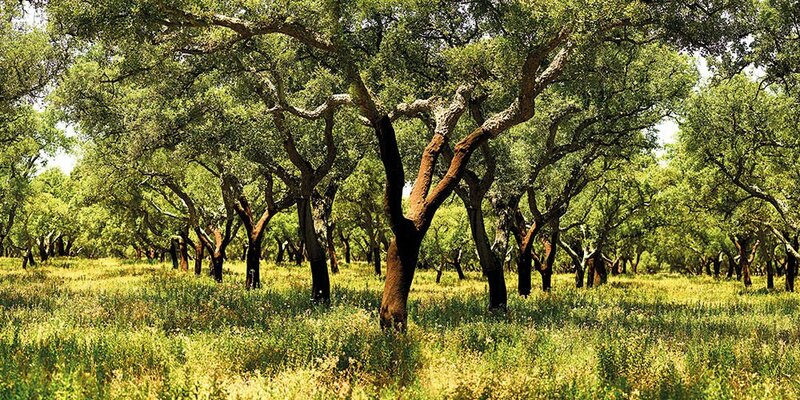 In fact, Portuguese cork oak forests retain 5% of the country’s annual CO₂ emissions. That’s 4.8 million tons per year! Cork flooring is actually a by-product of the cork bottle stopper industry. That’s what cork trees are largely stripped for, with the waste used in many different ways – including to create cork flooring planks! Cork-harvesting is an activity that passes from generation to generation, contributing to environmental, economic and social sustainability in rural areas. It also creates jobs and encourages people to settle in Portugal’s otherwise underpopulated regions. A sustainable industrial process means that our supplier can develop eco-efficient products with low emissions. Some products are even carbon neutral! The cork powder resulting from the process is burned as biomass and used as an energy source at production facilities. Sustainable & high-spec: meet our new cork collection.